What column is used in the MG when defining the dimension relationship? It appears only one column can be selected. Do I need to create a named query for the MG too? 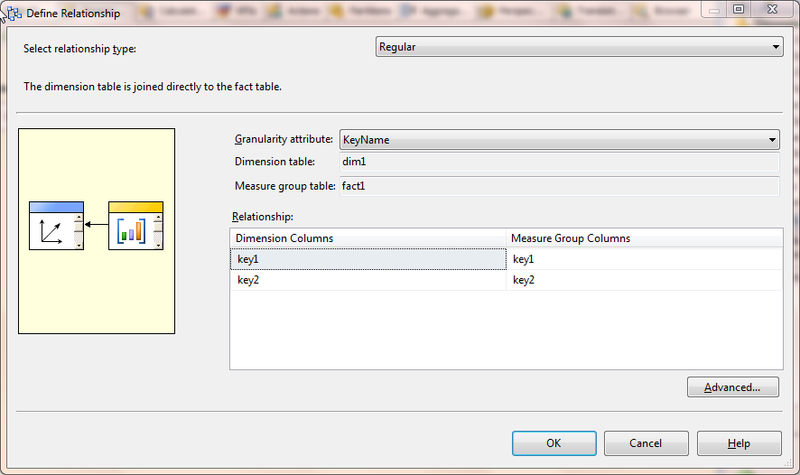 Hi Jake, in the Define Relationship window, the Measure Group Columns are key1 and key2. We can select 2 columns* for the Measure Group Columns. The Dimension Columns are also key1 and key2. The grain is KeyName though. I’ve added the screen shots in the post above. Hope this helps. No you don’t need to create a Named Query, you can use a physical table or a view. 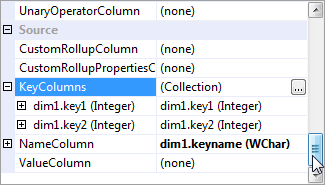 Whether it is a NQ, table or view, you must have a column for the key name, and 2 columns for the key values. *If you still get 1 column only, check the properties of the key attribute of the dimension. The key attribute should have 2 key columns and 1 name column, as per above screen shot.